A new study analyzed the effect of green roofs in a Mediterranean climate, finding that it can be quite effective in mitigating some of the effects of climate change, particularly when it comes to conserving water — a vital resource in a relatively dry climate. The green roof in the study. Green roofs (roofs covered by soil and plants) are making a comeback — they look great, and they have a number of important environmental advantages. They absorb and sequestrate a bit of carbon, improve and reduce energy consumption, and reduce stormwater runoff, retaining up to 75% of rainwater, gradually releasing it back into the atmosphere via condensation and transpiration, while retaining pollutants in their soil. 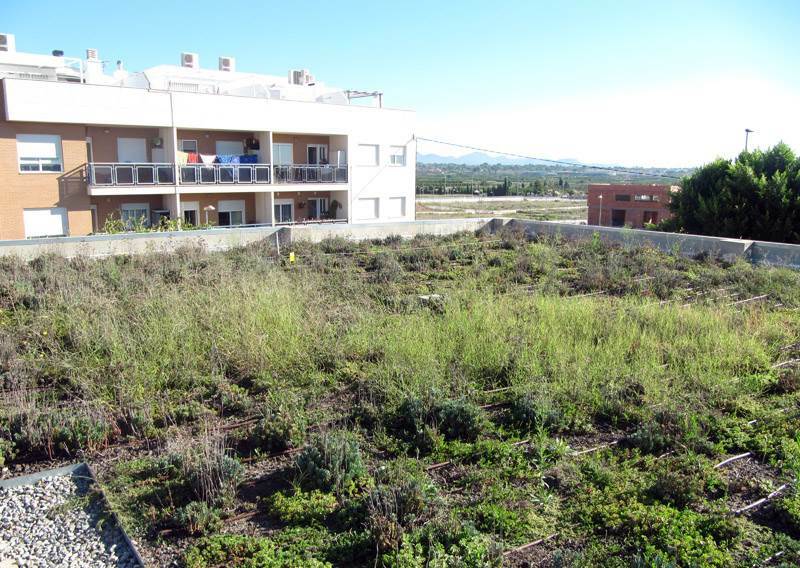 In a new study, researchers developed a test site in the city of Benaguasil (Valencia) where, in 2014, a traditional 315-m2 roof was turned into a green roof. They installed a pluviograph (an instrument for measuring the amount of water that has fallen) to analyse the rain data during the period monitored (from June 2014 to June 2015). Of course, results of the study are strongly dependent on the type of vegetation planted on the roof, as well as local climate. Mediterranean weather is characterized by warm, wet winters and calm, hot, dry summers. Despite the name, the Mediterranean area isn’t the only area to feature this type of climate — parts of California, Chile, South Africa feature similar weather trends. “Different studies show that the performance of this green infrastructure varies depending on its hydro-climatic exposure, specially regarding rain patterns (frequency, amount of rain) and the ground’s humidity conditions, which made it necessary to quantify its performance in an area with a dry climate, such as the Mediterranean,” explains Ignacio Andrés-Doménech, lead author. Overall, results show that the effective range of rainfall that can be controlled by the green roof is 15–20 mm, which corresponds with the most frequent rainfall events within this type of climate. This is significant, and “in a scenario where half of the roofs were turned into green roofs”, the rainwater runoff could be reduced by as much as 75%, researchers say. Although this study quantified a specific benefit of green roofs, there are still downsides to them: the initial cost is higher, they require more maintenance, and they add more weight and strain on the overall building, which tends to add even more costs. Balancing the advantages and disadvantages of green roofs remains a site-specific problem, but there is already quite a bit of science suggesting that, at least in some climates, they are a much-welcome addition. The study was published in the journal Sustainability.